When it’s hot it’s not what it is when it’s cold. And, when it’s cold it’s only a hint of what it is when it’s hot. Their true colors only appear when filled with hot liquid. “They” are “Wondermugs.” Inspired by the entrepreneurial creativity of Jim Simpson, the colorful “thermochromatic” mugs bring new meaning to a “jolt of java” anytime of day or night. 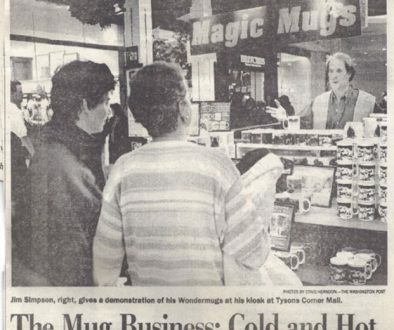 As a former analyst for the Office of Management and Budget, Simpson quit the government in 1993 to begin a business developing and selling color-changing beverage mugs to the retail gift industry. This past August he opened his first full-time store at 1022 King St.
“When I was at OMB I started making T-shirts with the slogan “Politically Incorrect” on them. They were just blue T-shirt with white lettering but everywhere I went people wanted to know how they could get one,” Simpson said. “That’s when I also started making mugs and hats with the same slogan. Then I stumbled across a company that made this disappearing ink. But, they were only doing promotional cups for companies and associations to be given to customers and members,” he said. “I started developing other designs in 1993 and applied for a business license in 1994. I talked my sister into doing some of the designs. She’s a very good artist. I also made contact with other artists who now do a lot of work for us,” Simpson said.